Turf Hacker: Lean Mean and Green! 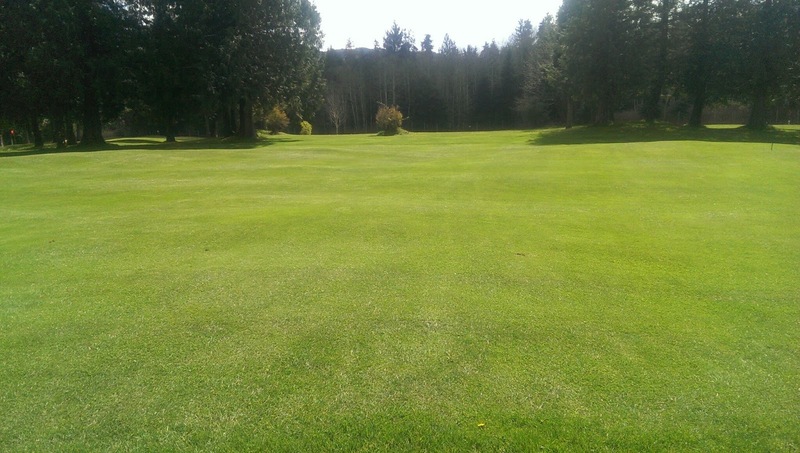 Mid April has always been the time of the year when the course really comes alive on the West Coast of Canada. In the past I always attributed this green up flush to the weather but also to my heavy spring fertilizer applications. Before I got onto liquid fertilizer applications and the growth potential model for predicting fertilizer requirements based on air temperatures I used to put out a heavy fertilizer application in March and then every 2 months until October each year. Now the rates vary depending on the average temperature for each month. The rates in the early spring are quite low with March seeing 3 bags of 21-0-0 going down on 5.4ha of turf and April seeing 4 bags go down. This is quite the contrast to the old way we did things with a granular fertilizer blend going down with about 40 bags every 2 months! Now we put down about 40 bags for the entire season. The last granular fertilizer application on fairways was done in June of 2013 and the conditions have only improved. The last granular fertilizer application on my greens was in 2011! The really interesting thing to me is that even with this drastic reduction in fertilizer use there is still a phenomenal green-up in the spring and the turf looks great all year long. 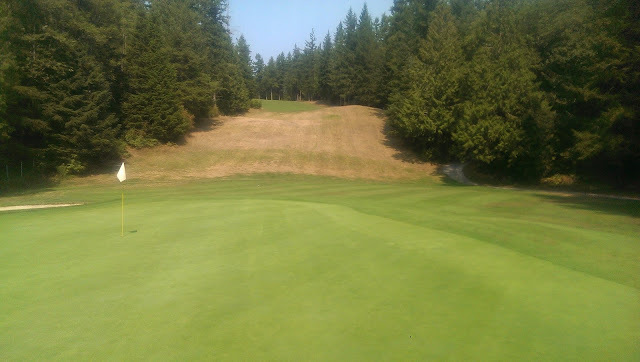 There are few weeds and we haven't used a pesticide on the fairways in over 15 years. There is a little poa out there but it is the minority with rye, bent and kentucky bluegrass forming the majority of the turfgrass stand. I have told others about what I have been doing in conversation and the response is usually "but I get such a good green-up from that fertilizer application in the spring." My response is have you ever tried not applying that heavy spring green-up fertilizer application? The answer is almost always NO. This reminds me of the importance of check plots. One of the best plots I have seen is the one from Jason Hooper (@superjhooper) He has been using them on his greens and fairways to show the effects of his turf health programs. The crazy thing is that those check plots look great even with no applications of fertilizer, fungicide or wetting agents. Definitely makes you think. 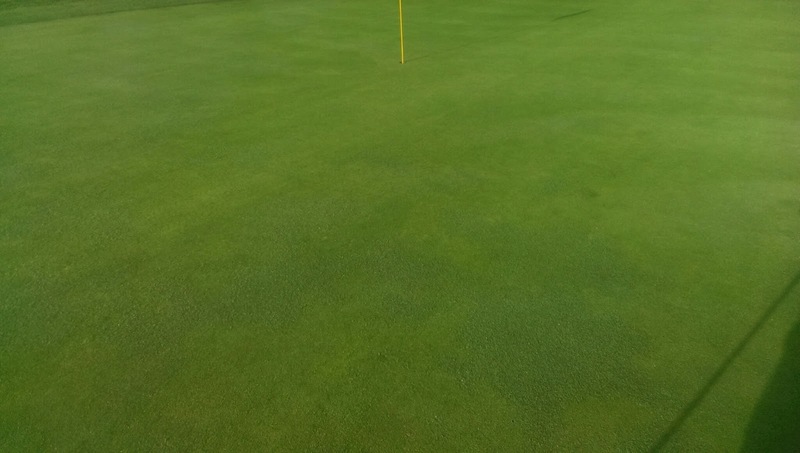 Also notice the abundance of bentgrass in the plots! Very cool stuff. Others have also shared with me their success with going lean and mean on their turf. The result seems to be that more bentgrass comes in and out-competes the Poa annua. Here's another tweet and I have to say from my observations on my course I completely agree. I have been working to get some bentgrass established in my greens and have subsiquently done a lot of research into what others are doing to get good establishments. The majority of studies and articles about interseeding bentgrass are not successful over time and I think a lot of it has to do with the fertilizer use. Take the establishment guide for T-1 bentgrass for example. They recommend a 1.5lb N/1000 sq ft to start followed by 0.5lbN applications every 2 weeks after establishment. This would put down more fertilizer in 3 weeks than I put on my greens in 6 months! No wonder people are having issues with thatch and their bentgrass greens! Thatch = more aeration with leads to more poa. I have yet to read about someone inter-seeding and going "extreme" and not flooding their greens with fertilizer after seeding. All the studies I read also use relatively high rates of fertilizer after establishment. I have only used light nitrogen applications with a little potassium here and there for the past 4 years and have seen the bent come on strong. This year I plan to go even lower in my nitrogen rates in the summer to take into account the nitrogen released from organic matter. If I was a fertilizer salesperson today I would mix up a liquid fertilizer blend to promote bentgrass and it would have a little n, little, k, lots of iron (to make you think it's working "ooooo look how green the grass is") and recommend high rates of my very low N fertilizer (to make more $$$$). I am confident this would result in a shift in bentgrass vs Poa on your greens. But for those of you who apply simple fertilizers, I would just apply less. Lots of bentgrass creeping in. this green is now mostly bentgrass. The point I am trying to make is that maybe we are doing it wrong? Maybe we are causing more damage with our fertilizer use than good? Maybe that fancy fertilizer program that babies the turf all season long is making it too easy for your poa to survive and compete with the hardier bentgrass? Maybe it is too easy for us to try and solve our problems by throwing more fertilizer at it? I don't think fertilizer has as big of an impact on our successes and quality of turf than we are lead to believe. Sure it is required to produce too turf, but probably at much lighter rates than we previously thought. Maybe that growth response we are seeing isn't because of the fertilizer?